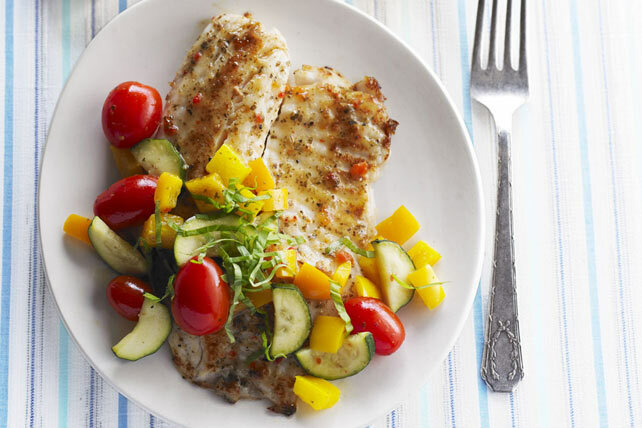 It's quick and it's fresh - our Fast Fish Skillet recipe serves up tender tilapia with a basil and veggie topping in less than 30 minutes. How's that for an easy skillet fish supper? Brush fish with 2 Tbsp. dressing; cook in skillet on medium heat 3 to 4 min. on each side or until fish flakes easily with fork. Transfer to plate; cover to keep warm. Add remaining dressing, vegetables and tomatoes to skillet; cook 5 min. or until peppers are crisp-tender and vegetables are heated through, stirring frequently. Spoon over fish. Prepare using haddock or cod fish fillets. Prepare using fresh or thawed frozen fish fillets. This tasty main dish provides an excellent source of vitamin C from the yellow pepper and is a great way to add fish to your diet.